There’s a Seinfeld skit about Dry Cleaning that I want to share with you all today. Aren’t we funny creatures? It’s amazing what we’ll choose to follow religiously as long as it’s coming from an ‘expert.’ But who are these experts? Is something automatically gospel because it’s been said x number of times by x number of ‘experts.’? Okay, so maybe not all of them. But chances are, somewhere in your closet is a wool or cashmere sweater that says ‘dry clean only’ on the label. Here’s the kicker: it’s actually a lot better to hand wash that sweater with shampoo (yes, the kind you use on your hair – remember wool is just another word for sheep’s hair) or gentle detergent, and then roll it up in a towel to squeeze out the water and lay it flat to dry. It’s possible, depending on the sweater, that you can even machine wash it on a gentle, cold cycle and then lay it flat to dry. Won’t my sweaters shrink? Not unless you wash them in a lot of agitation and/or very hot water and/or put them in the dryer. If you’re still not convinced, think about this: knitting has been around for centuries. Dry cleaning, according to Wikipedia, was discovered in the mid-19th century when someone spilled kerosene on a tablecloth (seriously). Now I know our ancestors weren’t quite as obsessive about laundry as we are, but I’m sure they occasionally washed their sweaters. How did they do it before dry cleaning? If you don’t believe me, try handwashing or gentle cycle an old sweater you no longer care about. 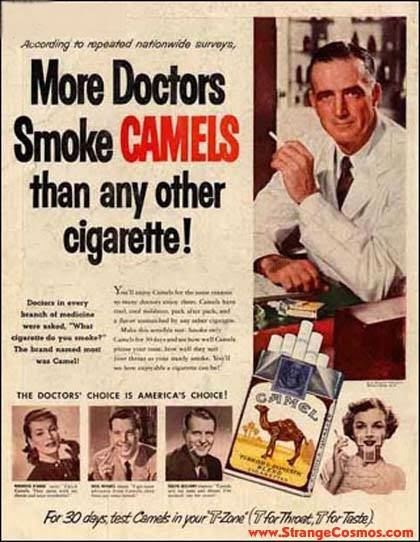 Doctors agree: smoking is good for you! Before I started knitting I’d never have given a second thought to obeying the clothing label. But any knitters/crocheters out there know that you will rarely, if ever, see a ball of wool, alpaca or cashmere that says “dry clean only.” I’ve never seen one. In fact, most knitters will advise you NOT to dry clean, because honestly, there’s nothing “dry” or gentle about dry cleaning. It’s actually a wet chemical bath. Isn’t that yummy? So what’s the point of this whole meander? I’m not bringing this up just because I wanted to save your sweaters. I was just thinking about how easily we fall prey to thinking we “should” do this or “shouldn’t” do that just because it’s considered common wisdom, without looking at our own specific situation or even where the “wisdom” originated. Then we feel bad because we don’t follow that “should” or “shouldn’t” – or worse – maybe we do follow it and things don’t work out, so then we feel like there might be something wrong with us, because the experts said it would work. If something doesn’t feel right to you and isn’t working for you then don’t do it! I’m not saying to ignore every instruction and warning label everywhere. But don’t blindly follow them without question, either. It’s okay to trust yourself. No one is more of an expert on you than you are. I’m curious: Did you ever ignore common wisdom and have things work out just fine? Or follow what you were ‘supposed’ to do and have it end up in disaster? Posted in thoughts and tagged authority, Dry cleaning, experts, life, Seinfeld. Bookmark the permalink.